The 2017 National Survey on Drug Use and Health, conducted by the Substance Abuse and Mental Health Services Administration (SAMHSA), found that the number of Americans initiating heroin use dropped by around half from 2016 to 2017. The number of Americans misusing opioids also dropped for the second year in a row, and the number receiving specialty treatment for heroin use increased. From January 2017 through August 2018, the amount of opioids prescribed in America has dropped by 21 percent. In the same time, the number of prescriptions filled for naloxone has increased 264 percent, while the number of prescriptions for buprenorphine, one form of medication-assisted treatment, has risen 16 percent (data from IQVIA's Total Patient Tracker). The Trump Administration will continue working to make progress against the opioid crisis, which in 2017 claimed more than 130 lives per day. SAMHSA awarded more than $930 million in State Opioid Response grants to support a comprehensive response to the opioid epidemic and expand access to treatment and recovery support services. 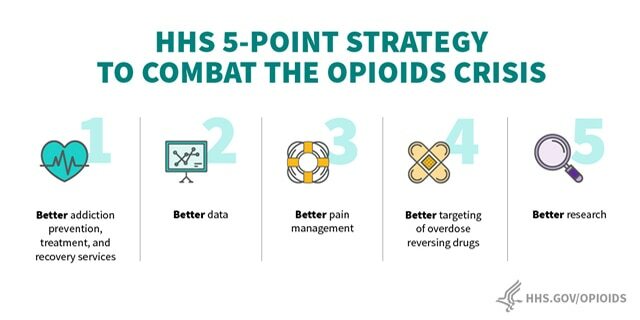 The grants aim to address the opioid crisis by increasing access to medication-assisted treatment using the three Food and Drug Administration (FDA) approved medications for the treatment of opioid use disorder, reducing unmet treatment need, and reducing opioid overdose related deaths through the provision of prevention, treatment and recovery activities for opioid use disorder. States received funding based on a formula, with a 15 percent set-aside for the ten states with the highest mortality rate related to drug overdose deaths. Other funding provided through this program, including $50 million for tribal communities, will be awarded separately. In addition, SAMHSA also awarded about $90 million to other programming for states and communities to expand access to medication-assisted treatment, increase distribution and use of overdose reversal drugs, and increase workforce development activities. $19 million awarded to 95 organizations under the Federal Office of Rural Health Policy's Rural Communities Opioid Response Program-Planning. To learn about HRSA-supported resources, please visit HRSA's Opioid Crisis page. The CDC awarded $155.5 million to increase support for states and territories working to prevent opioid-related overdoses, deaths, and other outcomes. This funding will advance the understanding of the opioid overdose epidemic and scale-up prevention and response activities, including improving the timeliness and quality of surveillance data. In addition, CDC awarded $12 million in funds to support 11 Tribal Epidemiology Centers and 15 tribal entities. These funds will improve opioid overdose surveillance so that prevention strategies can be targeted to better address this threat to tribal communities. CDC is also distributing an additional $ 27 million to nine non-governmental organizations, which will support states and territories with staffing, procurement, and training to enhance local public health capacity. To learn more about CDC-supported resources, please visit CDC's Overdose page.